Rent a mailbox with a Bend street address instead of a post office box to give your business address more credibility and to maintain the privacy of your home location. A mailbox rental at Postal Connections 101 is a professional, convenient and efficient way to receive letters and packages for your home-based or any personal business in Bend, OR. Why rent a mailbox when you have one at home? They prefer to maintain their business and home address separate by not co-mingling the two. It makes administrative life easier when you can separate the business and personal item flow. It creates credibility when a customer, supplier or vendor checks to see where you’re located. A street address appears more professional to business contacts than a PO Box. You are notified automatically when there is something in your box. Packages can be received securely during the business day. Consider renting a mailbox in Bend at Postal Connections 101. For an affordable fee which you pay to our store manager, the box is established. You receive a key to access the box 24/7. It’s easy, convenient and there are a variety of size boxes you can purchase. 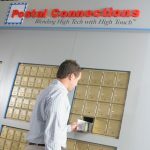 Postal Connections helps to maintain the image of your business with mailbox rental. You can use the address on all of your paperwork, on envelopes as a return address, on business cards and print it on any marketing collateral. We maintain your privacy in all transactions and make it especially easy to maintain a home-based business.